No gamepads detected. Press a button on a gamepad to use it. 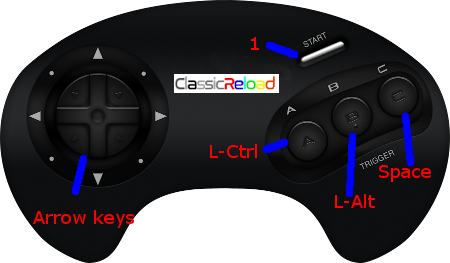 Each game uses different controls, most Amiga games use both mouse and keyboard. One of the first games released for the Sega Mega Drive/Sega Genesis, entitled "The Revenge of Shinobi" in North America and "The Super Shinobi" in Japan, this sidescrolling platform game for revolves around a shuriken wielding shinobi, Joe Musashi, searching for his stolen love who has been kidnapped by the evil corporation Neo Zeed. This game boasts an acclaimed soundtrack by the well regarded video game music composer Yuzo Koshiro. There were 3 versions of the game in US because of copyright and cultural issues regarding the boss characters, many of which were based on cultural icons. Version 1 - Batman, Godzilla, and Spiderman are bosses. No copyright screen acknowledges the use of these characters. Version 2 - Godzilla and Spiderman are bosses. Batman is replaced by a bat-like man. Version 3 - Godzilla is replaced by his skeleton, Batman is still replaced by a bat-like man, and Spiderman is still present, this time acknowledged by a copyright screen. Note that none of the versions have The Terminator, although there is a boss in the junkyard level who has aspects of both The Terminator, and the Hulk.